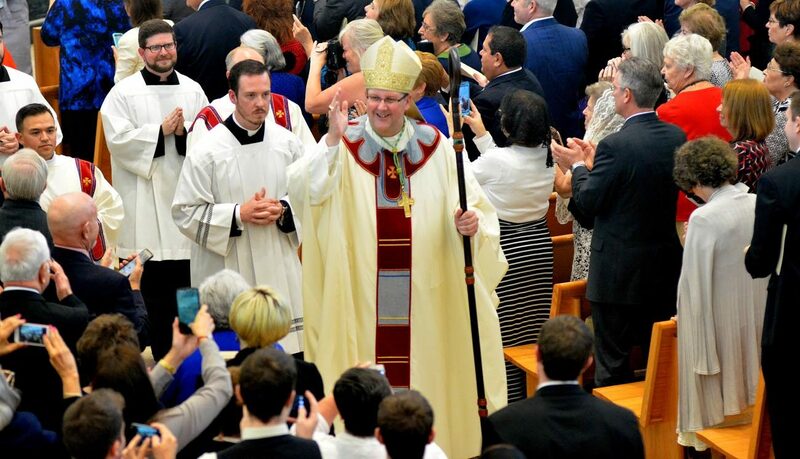 ST. PETERSBURG, Fla. (CNS) — Bishop Gregory L. Parkes, installed as the bishop of St. Petersburg Jan. 4, urged diocesan Catholics to focus on being missionary disciples. “Being a missionary disciple and church today often requires that we come out of our comfort zone,” he said during his homily at the Cathedral of St. Jude the Apostle. The 52-year-old bishop who had been the bishop of Pensacola-Tallahassee since 2012, began his homily by thanking Bishop Robert N. Lynch, who led the diocese since 1996 and submitted his resignation last year when he turned 75. To answer the pressing question of the day, he told the congregation that he is 6 feet 8 inches tall. He played basketball when he was younger and he is the tallest bishop in the United States. He also pointed out that he was a late vocation after working in the banking industry in Tampa. He entered the seminary when he was 29 and was ordained a priest for the Diocese of Orlando when he was 35. He said when he received word of this appointment he accepted it as God’s will and immediately prayed for guidance in his new role. When asked the difference between the dioceses of Pensacola-Tallahassee and St. Petersburg, the bishop said the panhandle diocese is larger in area but has a lower population of Catholics than his new diocese.